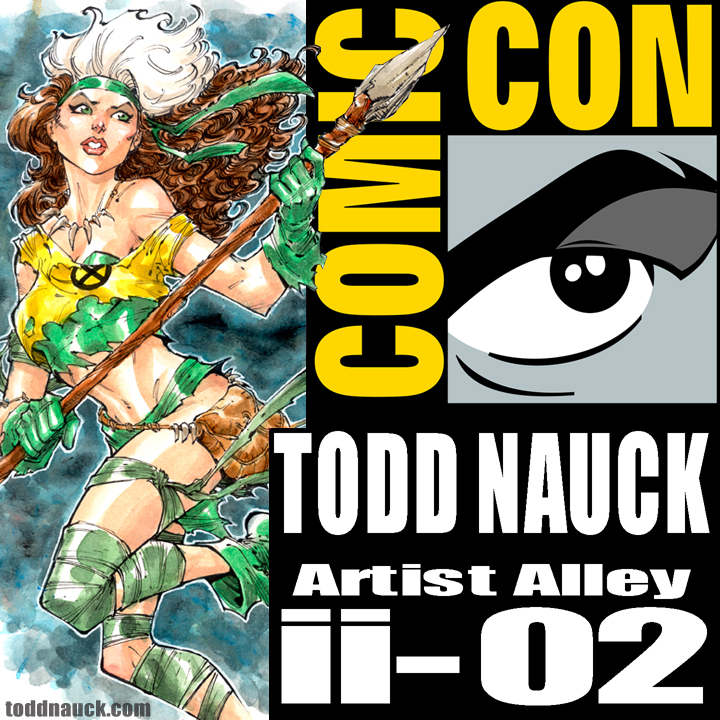 I’ll be at Comic Con International, San Diego, CA. July 8-12. Find me at Artist Alley Table ii-02. I will be a guest at Gabe Eltaeb’s Comic Kick-Off Party and Fundraiser on Wed, July 8, 9pm-1am. More info on that SDCC event HERE! 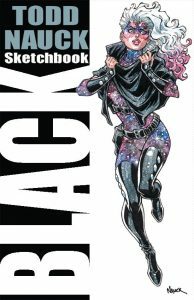 My NEW (and long overdue sketchbook) will debut at SDCC! 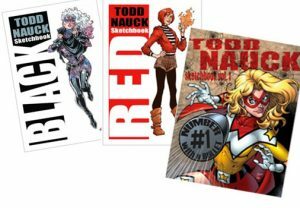 “Todd Nauck Sketchbook: RED” is 40 pages (plus cover),ashcan-sized (5.5×8.5), full color sketchbook featuring sketches, penciled art, inked art, Copic marker and watercolor illustrations. Don’t forget about my SDCC2015 Sketch Retweet Contest on Twitter! I will be taking a new sketch list at the beginning of each day of the con. The list has a limited number of spots so hit my table early to make sure you get a spot on the list. It can fill up fast! 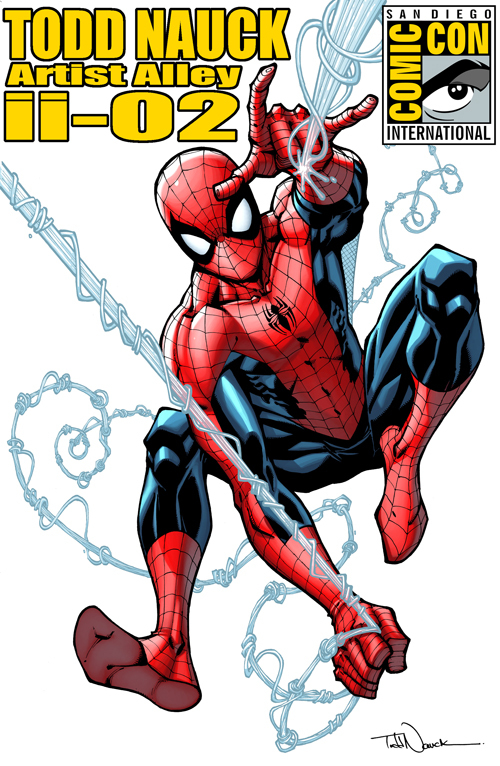 Silk #2, Silk #3, Deadpool #250, and any other retailer variants released: $5 per comic. Win great prizes. Meet great artists. Have great drinks. All for the GREATEST of causes! 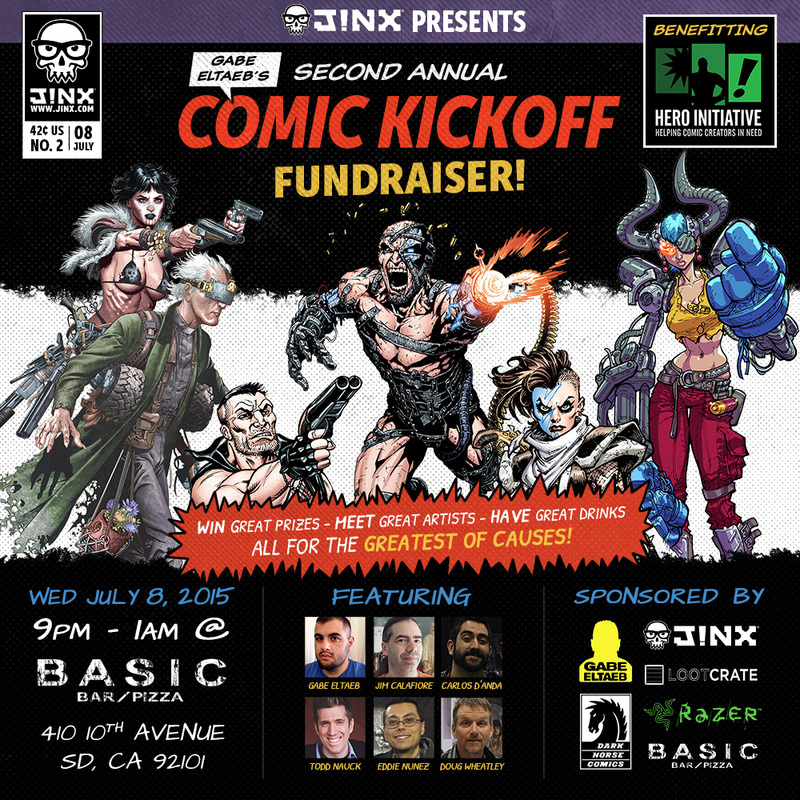 Come party with J!NX, Razer, Loot Crate, and Dark Horse Comics at BASIC during SDCC 2015 Preview Night! Our featured guests are Gabe Eltaeb, Jim Calafiore, Carlos D’Anda, Todd Nauck, Eddie Nunez, and Doug Wheatley. Sketches, prints and raffled prizes from Razer and Loot Crate with all proceeds going directly to the Hero Initiative. Come party with us for a good cause! 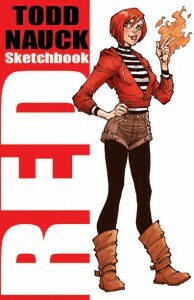 Want a chance to win an original convention style sketch of your very own? Here’s how my convention Sketch Retweet Contests work. After the convention, I use a random number generator to find a winner from all those that retweeted any/all of my convention sketches hashtagged for that weekend. The contest runs Wednesday, July 8 to Monday, July 13, 2105. The winner will be announced sometime on Monday, July 13, 2015. Any retweets of any convention sketches after the winner has been announced are not valid for the sketch prize. 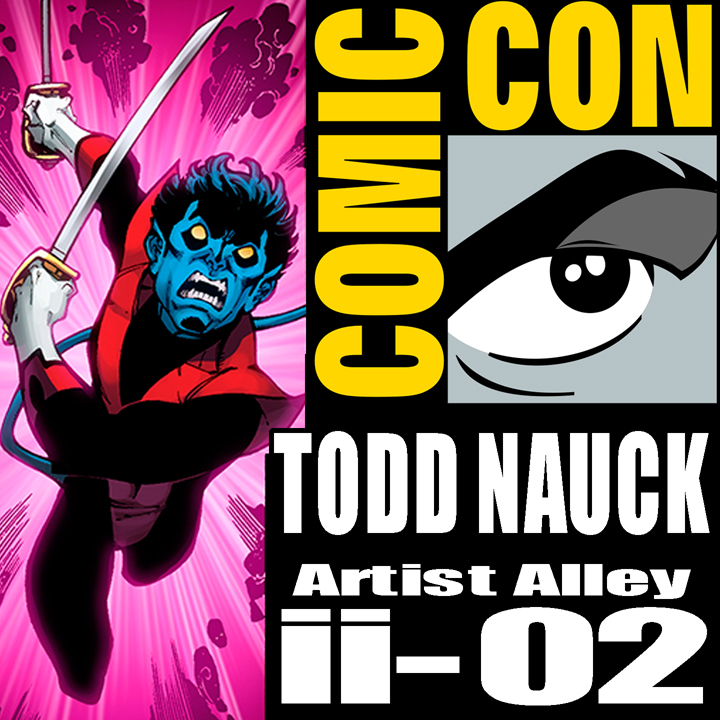 Click here for more info on my San Diego Comic Con 2015 convention commission info. Remember! You DO NOT have to attend the convention to retweet sketches for a chance at the sketch prize. It is open to anyone, anywhere, with a Twitter account! I thank you all again for your continued support and enjoyment of my work! 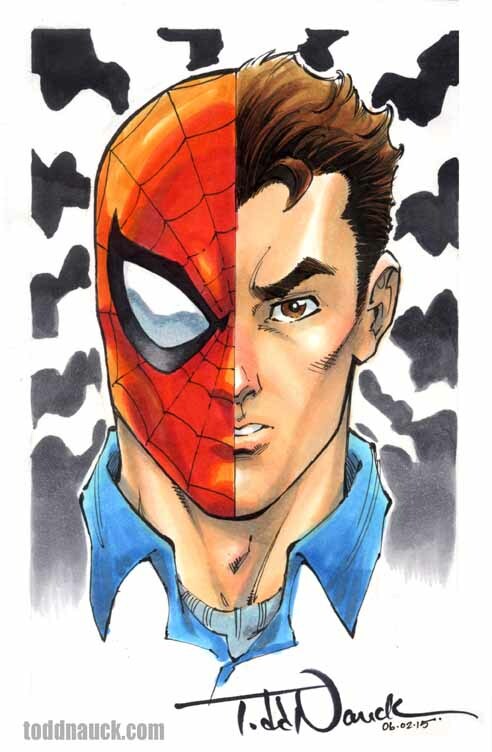 My Phoenix Comicon 2015 Sketch Retweet Contest winner’s sketch choice: Peter Parker/Spider-Man! I’ll be at San Diego Comic Con, July 23-27. On Wednesday night, after Preview Night, I will be a guest at Gabe Eltaeb’s Comic Kickoff Fundraiser where I’ll be doing a limited number of commissioned sketches to benefit the Comic Book Legal Defense Fund. I’ll be appearing on Marvel’s livestream on Thursday at 6pm at the Marvel Comics booth. UPDATE: I’ll be signing at the Marvel booth on Friday, July 25th, at 5pm. I will be on the Marvel Unlimited panel. Sunday, July 27th, 10am at the Bayfront Hilton. SDCC is next weekend, July 17-21. Here’s where you can find me and my commission prices. I’ll be at Artist Alley table ii-02 a vast majority of the time. I’m doing a signing with my Invincible Universe colorist, Gabe Eltaeb, at the Skybound/Image Comics booth #2729 on Friday, 12pm-1pm. I pretty much do not take a list or do drop-offs (it’s not unheard of, but it’s very rare!). I draw each commission for each person as they wait in line, hang out, and chat. 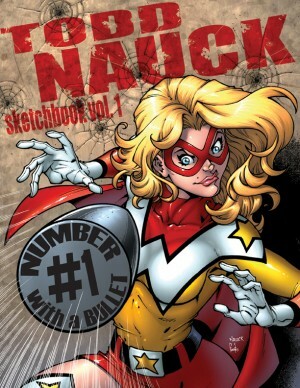 I’ll also have my Volume 1 Sketchbook, art prints and original art/commissions for sale. More convention appearance announcements to come!